Unit 19 Lot 85. 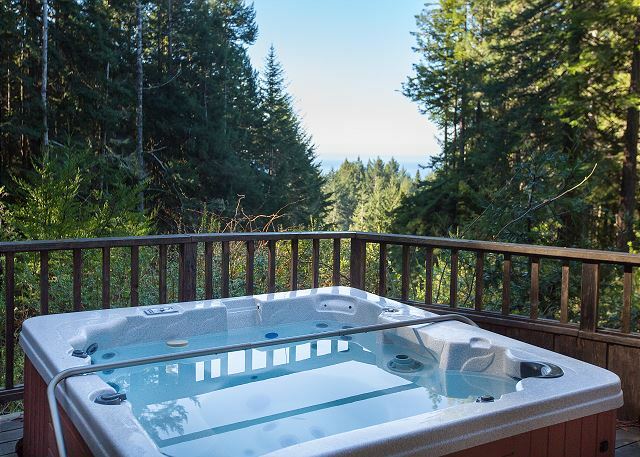 Peaceful and secluded, Sea Trees is a wonderful property in The Sea Ranch for a family or two couples looking for a comfortable escape. The game room is perfect for the kids to watch TV or play xbox, while upstairs, another great room exists for the adults to relax and spread out. Three bedrooms all on the entry level are easily accessed, two with queen sized beds and the third has a single trundle bed. The nearby hiking trails are in some of the most beautiful parts of Sea Ranch and expect to see plenty of wildlife during your walks. Relax in the hot tub on the lower deck, read a book in the quiet of the upstairs great room or do some cooking in the spacious kitchen. Its your choice on how you choose to decompress. The house was clean but very dated on the inside. Wifi did not work and when we notified the front desk at check out the response was "okay, I don't know." I would expect some sort of refund since all amenities were not available but she just kept saying "i don't know" until we left. Great stay up in the woods. Very cozy and comfortable! Our one complaint is that there was a very bad ant problem in the kitchen. I'd encourage the owners to do something about that! A soothing and peaceful location to walk out amongst towering fir and redwoods, while being reminded of the ocean nearby through stunning window framed vistas. Our older children enjoyed the quiet, cozy, and spacious surroundings-- complete with woodstove, games and a great movie selection. We had a great time at Sea Trees - it's on the uphill/mountain side of highway 1 (not coast side), tucked into the trees but with a view of the ocean. Miles of hiking trails very nearby, close to the Sea Ranch "Hot Spot" on the river. The third bedroom is not pictured in the photos but has a single with a trundle bed. All beds were comfortable, with good sheets and pillows. The room with the purple bedspread has an en suite bathroom (shower only, no bath). The two other bedrooms share a hallway bath (with tub). Good towels and hotel toiletries provided. Upstairs has large sliding glass doors that make you feel like you're in the trees - lovely. Kitchen was well-stocked and has spices, canola oil, etc. The house has a bunch of board and card games. Two neighboring houses are quite close by - the three share a driveway (you can't see that from the photos so I thought I'd mention). Recommend the Del Mar rec center for the pool/sauna - a short drive away. We had a very nice time staying at Sea Trees. The home was nice and clean, had nice views (including from the hot tub)and many games & movies that we enjoyed. The beds were very comfortable and it was nice and quiet and peaceful. 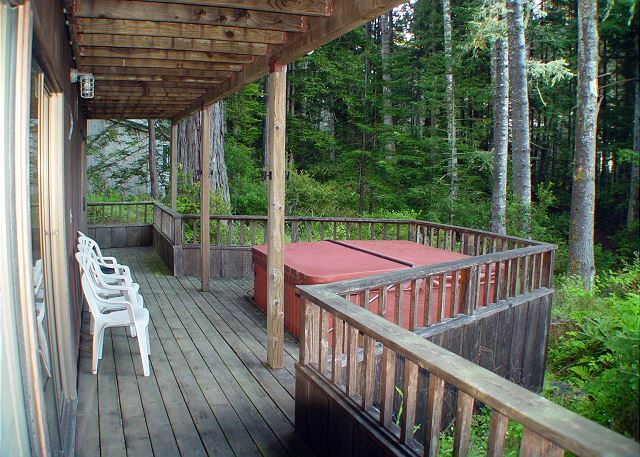 Very nice retreat, near many hiking trails, and close proximity to several beaches.